You frequently write about books and reading with your children. I am the mother of two children, a baby and a 2 yr old. While I do read occasionally to my 2 year old, I wonder how I can instill a lifetime love of reading in them. How do I find good books? Any wise words of advice? I know people who tell me that they don’t read. Ever. Not because they can’t, but because they don’t want to. They don’t enjoy reading. I can’t even understand this. It would be like someone saying they don’t like rainbows or candy or shoes on sale. I have to think that somewhere along the way they were “taught” that reading isn’t fun. That it is a chore. Something that isn’t done once you leave the academic world behind. I think the fact that you are already reading to your two year old is a great place to start. See if your local library has an informal story time that you can attend. Barnes and Noble also has weekly story times for preschool aged children. They are free to attend, though you will probably end up leaving with a few new books under your arm. Click on the link to locate the participating store near you. I think we all know the classics: Pat the Bunny, Good Night Moon, and Guess How Much I Love You. Of course all the books by Dr. Seuss and Maurice Sendak. I still have my Little Bear books from when I was a child, before it was bastardized into a Nikelodeon cartoon. Classic books stand the test of time. But what about newer books? Ones that we might not be familiar with. Your local librarian can be a good resource as can asking some of your peers who have children. They will probably have read their children’s favorite books so many times that they can recite them word for word as well as give you the title and author. However, over the past few years I have a few resources that I love and refer to often. Is your child very interested in a particular topic– trains, dinosaurs, knights– you can find books on these topics appropriate for their ages. A few years ago my son was fascinated by the Titanic. I think we have successfully read every single children’s book on the subject out there, including books about icebergs, ship building, and even penguins. Why? Because penguins live where there are icebergs of course! This is a great resource. 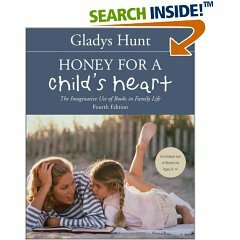 It lists books for various ages and give a brief summary. It’s like a annotated book list. This book follows the Core Knowledge curriculum and offers books to read based on what your child is probably doing subject wise for each grade. If you have ever read the What Your ____ Grader Needs to Know, you will likely appreciate this book. 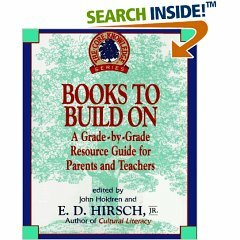 It is an add-on of sorts to that series, answering the question, “What other good books are there on these topics?” I imagine that it would be a good supplemental resource for children who are attending public schools, as many public schools are now following the Core Curriculum. I just found this book at my local library last week and it is one I immediately added to my wishlist. It is more than just a list of books. At 500 hefty pages, it has hundreds of ideas for activities, anecdotes, ideas for encouraging reluctant readers, and on and on. The description of the book on amazon calls it an “exuberant treasure trove” and I am hard pressed to find any better words to describe this massive volume. 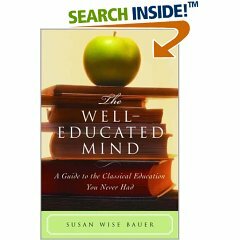 The Classical Christian Education Support Group has a web page listing 1000 Good Books. Good books being defined as those which have a timeless appeal. They are divided up by age/grade level. It is by no means an exhaustive list, but a wonderful resource nonetheless. But what is it that these books all have in common? How do you encourage your children to become readers? 1) Read out loud to them daily from the time they are babies until they will no longer listen to you. My 12.5 yr old will still listen to me read stories out loud. Pick an exciting novel and read a chapter every night before bedtime. Or in my house, we read our chapter books after lunch when my youngest takes a nap. Pick a time of day that works for you and doesn’t make reading become a chore. 3) Model good behavior. If your children see you reading for pleasure, they will think that reading is something people do for fun. 4) Set up a reading corner in your house. Buy or build some bookcases. Throw down a little area rug and a bunch of large pillows for laying on. Make it a place where your child feels comfortable and wants to spend time. Kids love little nooks that belong to just them. 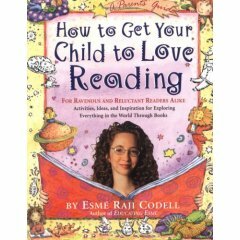 5) Never, EVER punish your child by forcing them to read. For the love of all things holy do not do this. Or I will have to come over and beat you with a book or two. And just one more book before I end this post. One for you. This is a fabulous book for teens and grown-ups. I refer to it when I feel like reading a one of those books I “should” have read a long time ago but have somehow escaped me. It gives tips on reading some of the world’s greatest books in all the major genres. If you feel like your education was somehow lacking, then this is the book for you. I am not Irish. Not one little bit. My husband is Italian. And yet, come March 17, we break out the green. A friend of mine dyes whatever milk is in the bottle green for St Patricks Day. The leprechauns do it. While I think it is an adorable idea, I know my children would balk at having green milk to pour on their cereal. Blend for 10 seconds or so. You may need to double, triple, or quintuple to the fifth power. The History Channel has a St Patrick’s Day website for you to enjoy with your children. It is a very comprehensive look at St patrick’s Day. 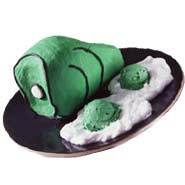 The true story, the legend, green beer, and other assorted recipes that are not corn beef and cabbage. Gag. Sorry, I couldn’t help myself. Before I posted my pretzel recipe a couple weeks ago, I searched online for a recipe that didn’t require letting the dough rise. I know some of you are afraid of the yeast and kneading. Family Fun had this recipe that was easy and fun. It is made from canned breadstick dough and then sprinkled with colored sugar. Though I would just make it with my regular bread recipe. I will also be resurrecting my treasure hunt idea, where the kids will go on a hunt to find a little black pot filled with gold. Gold foil wrapped chocolates, which to them are even better than real gold. I did but these tiny little treasure boxes and I had big plans of filling one for each child and having each of them go on their own individual treasure treasure hunts, but that just didn’t work out. Maybe St Patrick’s Day 2010 I’ll be more prepared. But we did make green cupcakes, just regualr cupcakes with a little green food coloring added, with vanilla frosting. 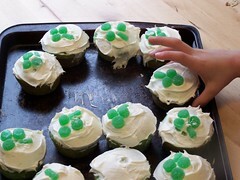 The I cut up some green spice drops and had the kids make shamrock shapes on the top. And then we ate half of them. Saving the other half for tonight after dinner, once we crash from our sugar high. And the next day we will give up our Irish heritage, at least until next March. I was browsing books at amazon earlier today for a different post I am writing when I came upon this book. This book pretty much covers the topic I was discussing in my previous post about art and children. 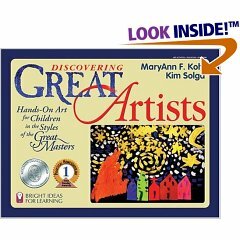 This book takes masterpieces by famous artists and provides ideas for projects designed to emulate their style. the one criticism of the book is that there are not a lot of examples of the artists work in the book. So if you chose to buy this book you would want to be aware that you will probably want to check out some library books on the artists as you work your way through the book. This book is on my list of books I want to buy. While I am proficient in art techniques and even the artists themselves, I think this book would provide some ideas that In would not even consider. 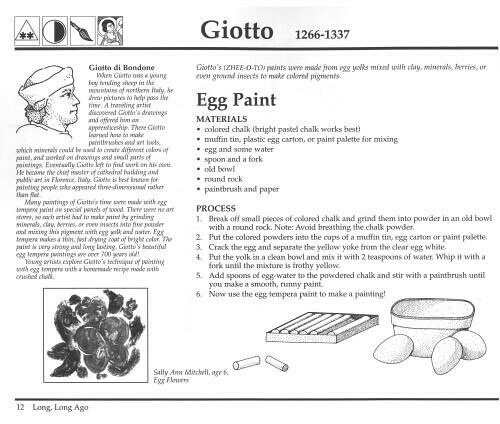 This page suggest making your own egg paint in order to replicate the paint used by Giotto an artist who lived iin the late 13th century. That would be a great hands on project for older children. I also think that adding these kind of activities to the study of art history makes it more memorable. I also happened upon this book, which appeals to the book lover in me as well. It is geared for the elementary aged school children and is slightly more accessible for younger children that the book above. This one I have on my list to check out from the library. I don’t have enough information on it to want to purchase it, or recommend other people purchase it. But the idea behind this book of exploring art techniques using illustrations from award winning children’s books intrigues me. And as much as I hate to say this, because we all know that old saying about not judging a book by the cover, but I don’t find the cover of this book at all appealing. And if the cover of a book which discusses ART isn’t visually appealing, well then I worry that the inside of the book will not be appealing either. 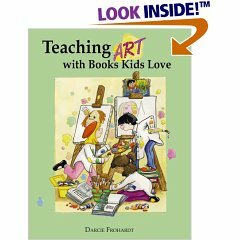 So those of you who commented or emailed me and asked for more insight into teaching art to children, here are two books that I think could be valualable resources for you and your child. 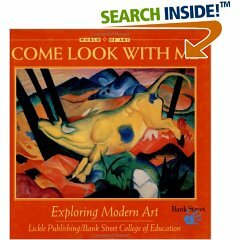 Yesterday I was at the library when I came across a book series, for children, called Come Look With Me. I had heard about this series of books before, but thought that they would be like every other art appreciation book geared for children I had come across, namely boring, dry, and uninspired. I couldn’t have been more wrong. There are no right or wrong answers. The questions are open ended and allow for different interpretations. What I like about these books is that they give children the language to discuss art. It introduces the terminology that will be useful for them to use when looking at artwork in the future. Not to worry, there is also a short biography of the artist and some insight into their work as a whole so that if youa re not familiar with a particular piece, you will not be left floundering. Think of this series as the gateway for further art explorations. Perfect for introducing ideas to children before bringing them to a museum. The book series says that it is geared for children ages 4-8, but I would say it would work for even much older children. The reproductions of the artwork are large and colorful and engaing for all ages. I am frequently asked this question, about a variety of things in my life. And I hate to say it, but there is no secret. I think that most of the time we realize this and understand that there is no miracle. Though we wish for a burning bush to magically speak to us and show us the way to clutter free home and a perfect body, without having to do any work of course. The secret to losing weight? Well moving more and eating less calories. There is no secret pill going to make us all magically fit and trim. The secret to a flat stomach? Well, never having your stomach stretched out to accommodate a watermelon would be a start. As would be doing sit ups. I strike out on both accounts. I have enough extra skin on my stomach to make a suit of skin for a whole ‘nother person. Remember that serial killer in Silence of the Lambs? He could have just had my stomach and never had to kill anyone, though I suppose that would not have been the point. The secret to being wrinkle free at 40? Genetics and a life spent living in cave without sunlight. The secret to a clean house? Uh, cleaning it? Never letting it get to the point where it is too messy to clean up easily. But still it doesn’t stop all of us, me included, from searching for that miracle pill, the perfect system that will revolutionize our existence, a panacea that requires no expended effort. Today I have a real secret to share. You know how in the winter when you wear a hat you are faced with hair that stands up like you are clutching an electric ball. To prevent this I keep a dryer sheet in my coat pocket. When I take off my hat I rub the dryer sheet surreptitiously on my head. Yes, I may look like a sweaty old bald man shining his head when I do this, but no fly away hair clinging to my face. And that makes it worth it. At least in my mind they are. Because who has room to store project after project! There is something about baking and cooking that children love. I suspect it has to do with taking ingredients, that seem somehow random to them, combining them and coming up with something that tastes good. “It’s like magic!” one of my children recently exclaimed after we baked a loaf of bread. Mix it all together like you would bread. Don’t know how to do it? Don’t have a bread maker with a dough setting? 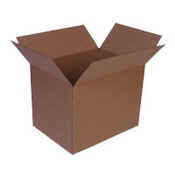 This is a great tactile experience for younger children. And it is extremely easy to do. I know what you are thinking, I used to be afraid of baking bread too. Measure water in first, room temperature. Too hot or cold and it will not rise. Then pour the flour, sugar, and salt in the bowl in a little mound. Dig a little hole in the top of the mound, like a volcano. Put the yeast in the little mound. Then stir it all up. 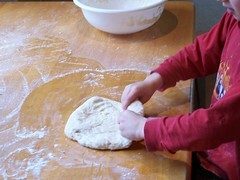 When it is doughy, dump it out onto a floured table and knead it. This is the part when all the kids can help. After they are done kneading, put it in a bowl and cover the bowl with a damp cloth so the dough doesn’t dry out while rising. Once it has doubled in size, it is ready to shape into pretzels. Break the dough into 12 pieces. 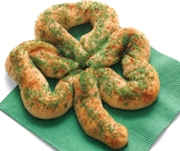 Your children can make the traditional pretzel shape. Form the dough into letters or shapes. Or even just leave them as pretzel sticks, but that would be boring. Once you are done shaping them beat an egg and brush it over the pretzel. Sprinkle them with Kosher salt. Or a mixture of cinnamon and sugar. Place on a greased cookie sheet and bake at 450 for 10-15 minutes. The time will depend on the thickness you have rolled the pretzels to. So keep an eye on them. Once they are golden, they are ready to come out of the oven and enjoy. You are currently browsing the A Year Off weblog archives for March, 2007.